We are Manufacturer, exporter and supplier of Laboratory Oven (Universal Memmert type), Batch Oven, Laboratory Oven, Multi Chamber Oven, General purpose oven, Drying Oven, Forced convection oven, Vacuum Oven, Universal Memmert oven, High Temperature Oven, Oil Fired Oven, Tray Dryer, Triple Decker Conveyor System, Industrial oven, Hot air oven, Tray Dryer, Trolley Type Oven, High Temperature Oven, Varnish Baking Oven, Oil Fired Oven / Gas Fired Oven, Infrared Oven, Rotary Rack Oven, Forced Convection Ovens, Thermo Setting etc. Double walled within Chamber of Aluminium/S.S. & Outside M.S painted with engaging stove enamel. 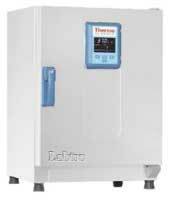 Thermostatically controlled from 100℃ quarto 200℃ (Max worker. 250℃) + 3℃_ in-built 'L'_Shape measuring instrument, 2 pailot lamps On/Off Switch with perforated trays. viable on 230 Volts AC. Memmert Type: Their double walled insulation keeps the heat in and conserves energy; the inner walls are made of Stainless Steel and outer walls of mild steel sheet, duly powder coated for striking appearance. The Heaters are placed in ribs at the bottom that are made of high-quality chrome wire and finest ceramic Beads. The Temperature Range is from ambient to 400 º C. Two perforated Stainless Steel shelves adjustable at any level are provided for keeping the samples. The optional air circulation system keeps the temperature in the inner chamber uniform and consistent.